A smooth and joint-gentle workout with the Kettler exercise bike Axiom is given by a balance mass of 10 kg and an induction brake system. Resistance can be varied from 25 to 600 Watt. 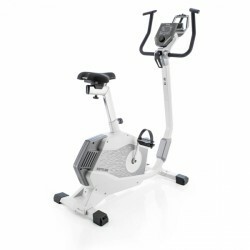 The Kettler exercise bike Axiom has eight programmes and a USB interface to connect the machine with the Kettler World Tours software (available as accessory). The sturdy construction can be loaded up to 180 kg. Saddle and handlebar are multiple adjustable. 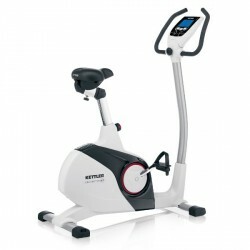 The Kettler exercise bike E5 is excellent for cardio training at home. The durable construction can be loaded up to 150 kg. 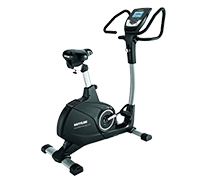 The resistance of the Kettler exercise bike E5 can be varied between 25 and 400 watt, 8 programmes provide diversion in addition. Kettler offers a complete and perfect range of exercise bikes for a comfortable cardio workout at home. 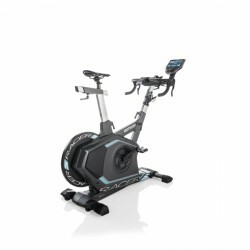 The variety includes affordable beginner modes like the E3 up to the highly loadable Axiom, which is already very close to commercial exercise bikes with regards to stability and performance. Thanks to their slim design, the Kettler exercise bikes do not only look great but also need small space in the living environment - it makes them ideal for smaller training rooms. 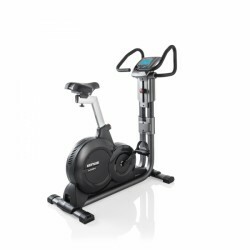 The high-quality selection of components according to the Kettler quality standard and the perfect alignment of the components make the exercise bikes of the German traditional company first-class home fitness machines made in Germany. The training with an excercise bike is very joint-gentle thanks to the smooth course of motion. 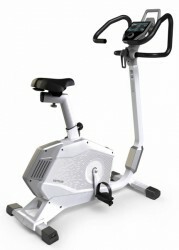 In contrast to the Kettler upright bikes, the load of the exercise bike is electronically controlled. It allows for a precise training control. The Kettler exercise bikes of the new generation are usefully revised with regards to the user and are equipped with user-friendly details. The particular: The new Kettler exercise bikes adjust to you - the basic version can be individualised with high-quality accessory. The new C and S series of the Kettler exercise bikes covers the whole range of exercise bikes, starting from beginner models Ergo C6 and Ergo S6. 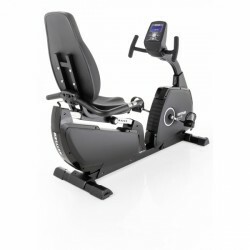 A more powerful drive, a smoother concentric run, a higher maximum user weight, and some more training programmes are offered by the Ergo C8. The Ergo C10 and the Ergo C12 come up with the highest step quality index as well as a premium display with upgraded funtions - i. e., a HIT training programme and personal coaching. The high-end equipment among the Kettler exercise bikes is the Ergo C12: It boasts with the best equipment - the multi-position handlebar and the 3D gel saddle are already included. 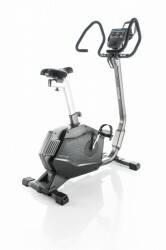 The new frame of the Kettler exercise bike is an extra stable steel frame with a hexagonal honeycomb shape. Together with the increased wall thickness, the frame is more stable than ever before. With the Kettler Ergo S6 or the C6, you can also choose between two frame geometries: sporty or comfortable. The steering tube of the sporty frame shape is twice connected to the body and offers hence a double stability. That's how the exercise bike keeps its stability even during most intensive loads. 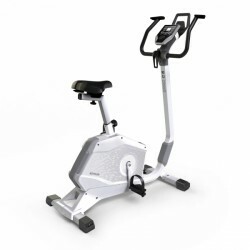 The comfortable frame shape with its low step-through allows for a comfortable getting on and off the exercise bike: just get on and start pedalling! The frame shape is easily reflected in the model description: S stands for sporty, C stands for comfortable. The saddle upper parts are a comfortable upgrade of the existing saddle or offer a comfortable sitting possibility for further users of your Kettler exercise bike. When several family members use the Kettler exercise bike, for instance, everybody can easily mount his/her personally favourite saddle before the training. Even the saddle tube of your Kettler exercise bike can be individually adjusted: It is available either with the standard length or longer. The long saddle tube is very recommendable for tall persons, because higher sitting positions can be adjusted here. 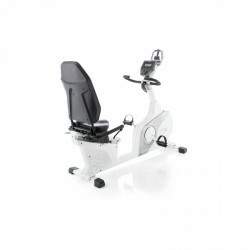 Kettler breaks the mould with its cockpit as well and upgrades distinctively the console: The use via the central jogwheel is completely intuitive, the clear menu navigation helps you to get quickly to your desired training programme. The display convinces by the precious acrylic glass surface. The tablet or smartphone can be placed in the holder above the console. All new Kettler exercise bikes are equipped with the HRC training programme (heart rate control), which makes a pulse zone controlled training possible. The training in the ideal pulse zone is very effective, because you can head for the appropriate pulse zone according to the training target. The extra feature of the Premium display of the Ergo C10 and C12 is a HIT training programme and a personal IPN coaching. The new Kettler exercise bikes now offer an easy-to-open lever, which tightens reliably the handlebar and replaces the screw, which was often so tight that it could hardly be loosened after tightening. That's how you can easily change the standard handlebar, for instance, with the multi-position handlebar, which offers more grip positions and which relieves the shoulder and back muscles. It is also ideal for smaller persons, because the space between saddle and handlebar is shortened. Another difference of the new Kettler exercise bikes is the evaluation of the concentric run according to the pedal quality index instead of according to the balance mass. Because the weight of the flywheel alone is not a decisive size of an exercise bike. The Kettler internal pedal quality index (Kettler-TQI) informs about the quality of the concentric run: The higher it is, the smoother is the concentric run. The training with a Kettler recumbent exercise bike like the RE7 is very protective for back and joints. Due to the low step-through, the ergonomic seat, and the high, multiple adjustable backrest, the recumbent exercise bikes of Kettler are ideal for all those, who look for a gentle, ergonomic training position. 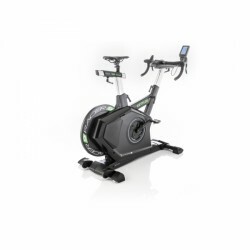 Regarding the brake system of its exercise bikes, Kettler focusses on the electro-magnetic induction brake, where a smartly controlled electromagnet brakes the flywheel. This brake system has the advantage that it is absolutely precise, smooth, maintenance-free, and durable. It is also used for professional sport and therapy, because this technology allows for a precise performance in 5-Watt increments. Kettler World Tours is the interactive software for all compatible Kettler fitness machines. You can record tours per smartphone or GPS device outdoors and cycle it with your Kettler exercise bike on 3D maps later on or compete a virtual race against other sportsmen in the online mode. Very clever: By means of the height profile, the software adjusts automatically the training load of your Kettler fitness machine.